Last week, three months into the fiscal year, the US Congress avoided a government shutdown and finally passed a budget for 2015. Better late than never. As I wrote about during the time of the midterm election, the budget situation is particularly important for science research and development and for education and public outreach. The $1.1 trillion and 1,600 page omnibus bill includes many important non-science issues of course, such as provisions reducing financial regulations and others allowing larger campaign contributions to political parties, and the bill does not address funding for the Department of Homeland Security, which will be decided in February, but my focus here, as usual, is on the implications for science. Many agencies will receive small budget increases for science and technology relative to FY 2014 and to the President’s initial budget request (but excluding his Opportunity, Growth, and Security Initiative). According to the American Association for the Advancement of Science (AAAS), federal research and development (R&D) would rise to $137.6 billion, which is a 1.7% increase from last year and consistent with inflation. This was not guaranteed, however, and scientists were braced for the worst. Under the current circumstances, the science budgets will fare rather well. Importantly, note that the budget bill includes discretionary spending subject to the caps established by the Budget Control Act (“sequestration”) and modified last year. In addition, the cost of mandatory spending, including Social Security, Medicare and Medicaid, continues to increase; without more revenue, these will take a larger share in coming years. 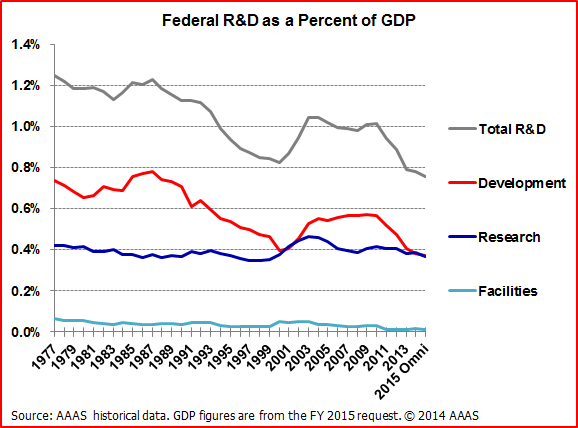 The following figure shows federal R&D relative to GDP. It’s courtesy of AAAS, and if you want more details about budget issues, I recommend reading Matt Hourihan‘s writings there, which includes a breakdown by agency. Details can also be found at the American Institute of Physics science policy news. For specific agencies, let’s start with NASA. In the omnibus bill, NASA received a budget of $18.01B, a significant increase over the President’s request and slightly larger than the inflation rate. For NASA’s Astrophysics Division, most of the budget increase comes from rejecting the President’s proposal to cancel the Stratospheric Observatory for Infrared Astronomy (SOFIA), a telescope mounted on a Boeing 747 aircraft that is funded at $70M. They will not have enough funding to implement all of the desired upgrades to the telescope though. The budget also includes $50M for the Wide-field Infrared Survey Telescope (WFIRST), which is expected to launch in the early 2020s. The James Webb Space Telescope (JWST), the successor to the Hubble Space Telescope, is funded as expected (under its $8B total cost cap) and is on schedule for a 2018 launch. The Planetary and Heliophysics Divisions also saw budget increases over last year, including $100M for a mission to Jupiter’s moon Europa (which might harbor life) and at least $100M for the high-priority Mars 2020 rover mission. Nonetheless, NASA may not be able to advance its smaller Discovery-class space probes and New Frontiers missions as quickly as hoped. For detailed coverage of NASA’s budget, check out Josh Shiode of the American Astronomical Society and Marcia Smith at SpacePolicyOnline. The budget includes an increase of 2.4% ($172M) to the NSF’s budget, and according to Shiode, this is partly thanks to efforts by the retiring chairman of the House Commerce, Justice, Science and Related Agencies (CJS) Appropriations Subcommittee, Representative Frank Wolf. There will be a 2.2% increase over current funding to research and related activities across the six directorates, while there will be flat funding for research equipment and facilities construction, including expected funding for the Daniel K. Inouye Solar Telescope (DKIST) and Large Synoptic Survey Telescope (LSST). I’m particularly looking forward to the LSST, which will be located in northern Chile and is planned to have “first light” in 2019. It will observe millions of galaxies and will be a successor to the very successful Sloan Digital Sky Survey (SDSS). The DOE’s Office of Science received approximately flat funding at $5.1B in the budget bill. The Cosmic Frontier program, which includes dark matter and dark energy research, will see a $6.4M (6.5%) increase in its budget, however. The bill reverses potential cuts to nuclear fusion research, and it importantly threatens “to withhold the US contribution to ITER, the multibillion-euro international fusion consortium [based in southern France], if the beleaguered project, which is 11 years behind schedule, does not implement management changes,” according to an article in Nature. The budget bill has multiple provisions affecting education. It includes legislation for a program that would allow students without a high school diploma to get federal student aid as long as they are enrolled in college-level career pathway programs. It also unfortunately includes a $303M cut in discretionary funding from the Pell Grant program this year, according to Inside Higher Ed. The budget will increase funding to $530M supporting institutions that serve percentages of minority and low-income students through Title III funding. NASA will receive $42M for education and public outreach, but the agency may have to shuffle its education budget, which has traditionally funded education activities in conjunction with every scientific mission. The NSF will receive $866M for education and human resources, including funding for its Graduate Research Fellowships. I don’t have good news about the EPA, which will now be funded at $8.1B this year, its smallest budget since 1989 according to Scientific American. The bill also includes some environment-related riders in the EPA and other agencies such as the following: President Obama will not be allowed to fulfill his pledge to contribute $3B to the United Nations Green Climate Fund; the Export–Import Bank will lift its ban on loaning funds to companies to build coal-fired power plants overseas; and the Transportation Department will not be able to fund most of its current light-rail projects. 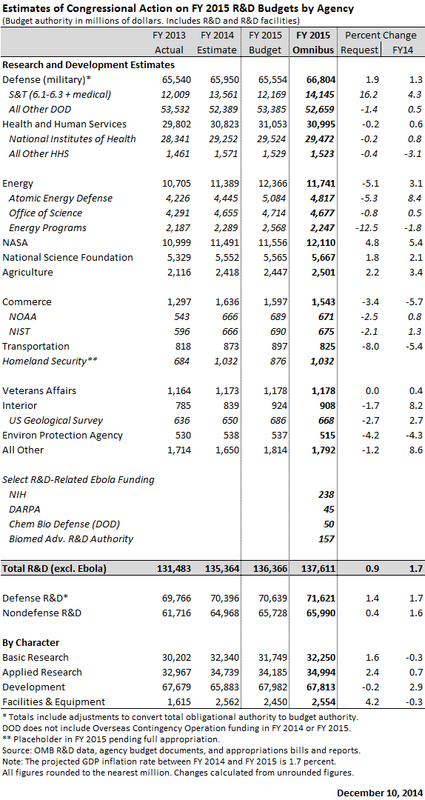 Finally, there are a few other agencies with science-related budgets. The National Institutes of Health (NIH) will receive essentially flat funding (0.3% increase). It will receive larger increases for cancer research, Alzheimer’s research, and the BRAIN Initiative on neuroscience. The bill also includes a multibillion dollar Ebola response that goes primarily to the NIH. The National Oceanic and Atmospheric Association (NOAA) will get flat funding, including full funding for its GOES-R and JPSS satellites for meteorological and polar research. The National Institute of Standards and Technology (NIST) received flat funding as well, and the US Geological Survey received a small increase. This will be my last post until next year, so happy solstice (or Shabeh Yalda, as the Persians say) and happy holidays!